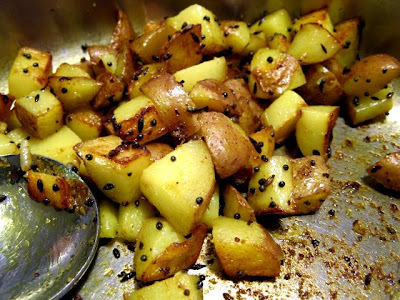 Now, on with the Quick Asian Dish of the day, Mustard Potatoes. This dish is part of a weeklong series that I’m doing in honor of Steamy Kitchen Jaden’s birthday. She’s looking for recipes that take 15 minutes or less to prepare. This dish was taught to us by friends of ours who invited us to their place for dinner. 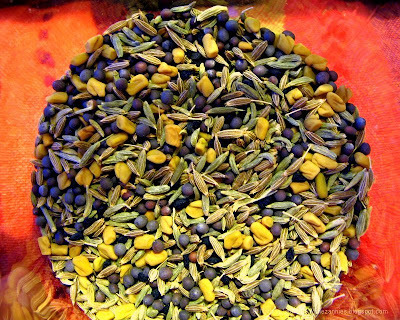 They are vegans from India, and they prepare dishes that are simply delicious. The food is so good, you can’t stop eating. Add the mustard seed and the cumin seed and toast in the oil until they begin to pop. Add the diced potatoes, turmeric powder, and salt. Stir gently to coat the potatoes. The salt causes the potatoes to being releasing water. 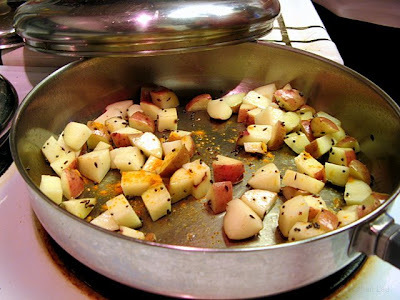 Cover the pan and let the potatoes steam-fry until they are browned on the outside yet tender on the inside (about 10 minutes). This dish is so tasty, it is absolutely irresistible! >i love, love, love mustard, and i think this is one of the most fabulous potato dishes i’ve ever come across! it’s beautiful and healthy and sure to be delicious. nicely done! >@Grace – Why, thank you for the kind compliments, Miss Grace! SWIFT Theme by Satish Gandham. 61 queries in 0.720 seconds.